Since 1986 in the Reagan amnesty at a clip of about 3 million per year, interlopers have chosen to cross the southern border or simply overstay their visas in order to gain residence in the US. I challenge anybody to show proof that there are less than 60 million interlopers living and working in the US today. Over time, because Democrats like the idea that the new dependent foreign class will vote Democrat one day, and Republican political elites want so much to please their donor class, who employ these "residents" at sub-minimum wage rates; that our government again intentionally has chosen to ignore the wishes of the American people to serve their own greed. The Donald Trump and Ted Cruz plans will definitely stop the new potential illegal foreign nationals at the border. However, nobody seems to care about those illegal residents who are beginning to think they own significant parts of America. My solution addresses the latter and it is the product of a lot of research and thinking. It is called the Annual Guest Plan and it should be passed and implemented ASAP. I will work as your Congressman to assure it happens. Over the last six years, I wrote two books, Americans Need Not Apply, and No Amnesty! No Way! These books captured the essence of the problem of 60,000,000 foreign interlopers living in America. Initially I had no solution so I kept researching and thinking and researching and thinking and finally it came to me. What if we made a deal with the interlopers and the American people within which both parts of the puzzle could live and be OK! Here is the essence of the Annual Guest Plan but there is lots more. As long as an annual guest is well behaved, and we get to define what that means, they will have a right to live in America and hold a job for which an American citizen is not competing. Annual guests will be 100% out of the shadows and will live like you and I within our neighborhoods, paying for housing as we do. Their kids will go to school and they will pay school taxes like you and I. In order to gain their status they must promise not to be a burden (defined as costing taxpayers) or they will voluntarily deport. The government will help in their deportation and in fact may offer a substantial stipend of $5,000 to $10,000 for those who agree to go and not come back without paying back their to-date burden. Americans will not pay a dime for annual guests for education, healthcare or general living. Iron clad identification databases and ID cards with biometrics will be issued and those without such identification will be deported immediately once the program is in full implementation. EMTALA will be provided but the annual guest receiver must immediately self deport if they cost taxpayers a dime. Annual Guests (AGPG) must begin their freedom in the US by registering at no charge at one of many facilities. US officials will know all illegal foreign nationals at that point as their status will be legal. They must apply for an annual guest visa and be approved or agree to be deported if they do not apply or do not gain such status. Americans believe the influx of illegal foreign nationals hurts them and from my own observations, we Americans are 100% correct. The table is turned in this program with the citizen now holding all the TRUMP cards. AGPG's will have no welfare or health benefits other than those provided by their employers. If they seek US benefits, they will agree to be summarily deported. They will not be able to vote in any election in the US for any office local, municipality, state, or federal. Unless they return to their home country, and begin a process like all others from that country, they can never become a citizen of the US. Registration will be free for a period until it is obvious all should be registered (perhaps 3 months) at which time registration will have a charge of say $50.00. All registrants must pay $100.00 to apply for lifetime guest status and go through a vetting process. Those granted annual guest status merely have to be well behaved. In year two, each lifetime guest must appear in front of US officials to be vetted again and pay their annual guest fee of $100. The fee is $100 per year every year unless it costs more to process them. Each year until the plan is proven. LGPG's must make personal appearances and pay their $100.00 to get their card renewed. The key point is that these folks are guests of American citizens. They are not American Citizens or ¼ citizens, or ½ citizens. They are guests. Once registered and approved, they have a special right granted by the citizens of the US to remain in the US as long as they are well-behaved, and no longer. They have no special privileges. American Citizens have all the privileges of citizens in their own country / state. There are other advanced notions in the plan that may help US officials deal better with the ongoing issue of people wanting to crash into America uninvited for various purposes. For example, The Annual Guest Plan should never cost the US more than if the plan were not in force. Illegal foreign nationals who choose to be annual guests and are granted permission are not permitted to ever become a burden, financial or otherwise on the citizenry of the USA. 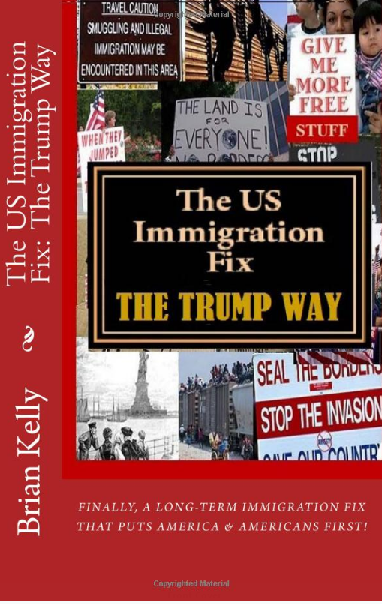 You have read a very light introduction to a very detailed plan intended for the benefit of Americans, but nonetheless accommodates over 60,000,000 foreign interlopers simply because America is a kind nation, and Americans have big hearts. There is no reason for Americans to pay for guests in any category, though the burden for such interlopers has been very large for taxpayers over the years. And so, a look at the costs of not having a annual guest plan v having such a plan; it is obvious that there will be some special things that can be done to help keep families together. For example, suppose an anchor baby through his or her parents could choose to take a $50,000 stipend to give up anchor baby citizen status and go home with his or her parents. What if the US also provided a large stipend for the mother and father to be resettled in a safe area of their home country? They could start anew with a bankroll and become big-shot entrepreneurs in their home country. There may be families who could gain a grub stake of as little as $70,000 to several hundred thousand dollars, depending on the # of children, to start fresh in their home country with their families intact. Why would they want to stay in America with no grand prize? The idea of the Annual Guest Plan is to help those stuck in America doing meaningless labor for peanuts. It is also a plan to help Americans subjugated to the effects of a new but clandestine wage scale that comes before all minimum wages, for which they cannot compete. Here is the cover of the original Lifetime Guest Plan, which is the precursor of the Annual Guest Plan. new book followed by the cover text of the book. The Annual Guest Plan (LGP) was developed by Brian Kelly in 2013 and released as The Kelly Plan. Brian examined the gang of eight plan, existing law, and other notions about how to solve the nation’s problem with illegal residents. He found none addressed all of the issues that having 20 million to 60 million illegal foreign nationals in residence brought to America. He read the gang of eight plan in 2013, and noticed that it smelled a lot like it was purposely designed to kill America. No jobs would be left for Americans; newly unemployed Americans would have to pay for newly minted citizens; voting in national elections was not ruled out; 33 million more foreign nationals would be invited; It would cost over $6 trillion. It was a terrible deal for the country. Kelly looked at all of the things that Americans did not like and he looked at what the interlopers liked. He figured out a way to permit well-behaved interlopers to stay in America while giving Americans priority in all ways. This plan actually will work and it will solve the problem and take a huge financial burden off the backs of Americans. Brian W. Kelly is the leading conservative author in America. He is an outspoken and eloquent expert on immigration solutions. Though a Democrat, he is a JFK Democrat. One of his pet peeves is the chicanery and deceit of RINOS on conservative Americans. Apply; No Amnesty! No Way! ; Jobs! Jobs! Jobs! ; The Constitution 4 Dummmies! ; and many other conservative books. Like many Americans, Brian is fed up with a stifling agenda in Washington that places the needs of foreign nationals in front of the needs of Americans. He wrote this book to help Americans know what we can do to force our government to regain control of our borders, ensure our national security, keep our culture, enforce our laws, protect American jobs, and keep all Americans from being overwhelmed by illegal foreign nationals with no allegiance to the USA. In addition to showing why amnesty is not the right medicine, Brian Kelly explains the best plan (AGP) for America again to become a sovereign state. This is Brian Kelly’s 60th book. He has written three more books since this You are going to love this book and the AGP plan, since it is designed by an American for Americans. Few books are a must-read, but The Immigration Fix, The Trump Way will quickly appear at the top of America’s most read list. 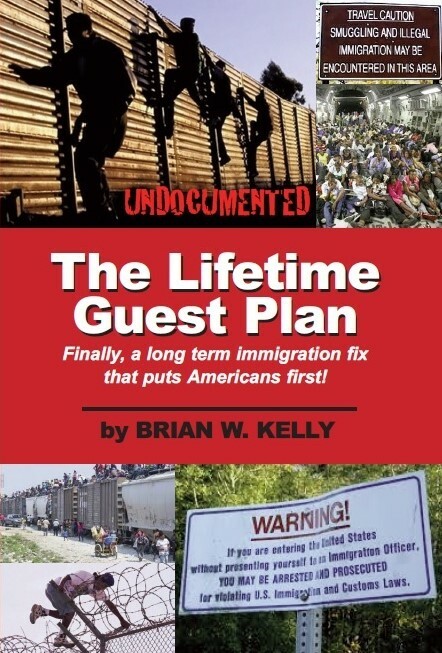 Brian modified the lifetime guest plan in 2016 and made it more amenable to the Trump plan for America. It is included in the new book called The Immigration Fix, The Trump Way, which is also available from Amazon, and Kindle.